The MV Giamani Thailand liveaboard is 24 meters (80 feet) in length with a beam of six meters (21 feet.) She takes 10 passengers plus crew. She cruises at 9 knots. Giamani carries plenty of fresh water and fuel to enable her to easily conduct short liveaboard scuba diving itineraries as well as longer scuba safaris and has a water maker on board. Her destinations include the Similan Islands, Koh Bon, Koh Tachai, Richelieu Rock, Phi Phi Islands, Koh Ha, Koh Rok, Hin Daeng and Hin Muang. She carries safety equipment for safe passage at sea including first aid kits, Oxygen, a DAN oxygen kit, two SOLAS life rafts, and SOLAS life jackets. Her communication gear includes VHF radios, CB radios, a GPS, radar, echo sounder and mobile telephones. She offers Nitrox. The dive deck is spacious with camera table and rinse tanks making this an ideal boat for serious photographers. 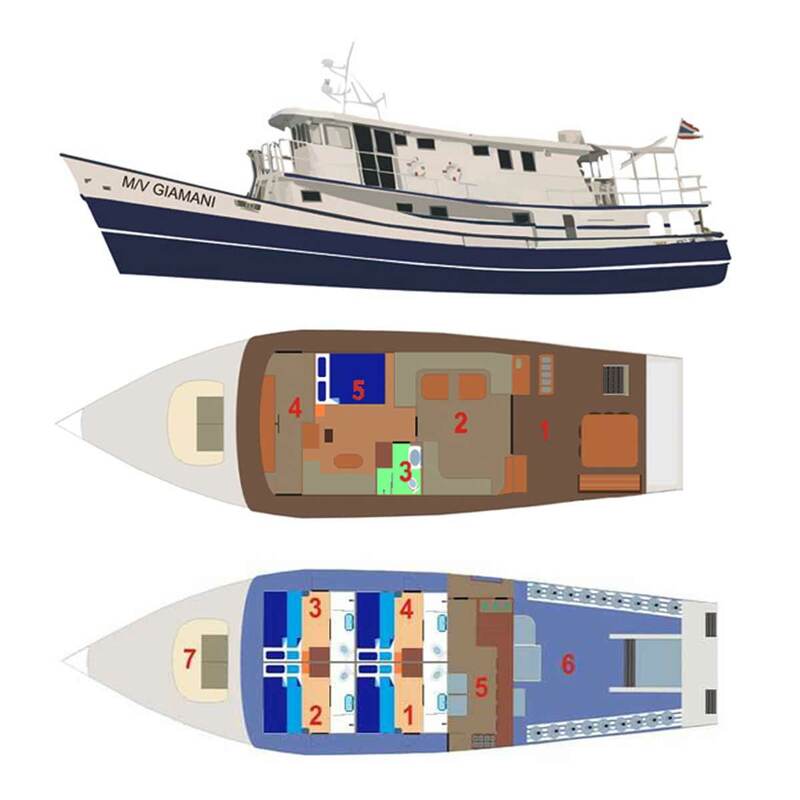 She has one master cabin and four deluxe cabins. The top deck master has one double bed and a convertible sofa that turns into two bunk beds. The door opens into the saloon. The four deluxe cabins feature a double bed with an additional extra bed for twin sharing. All cabins have their own air conditioning unit, mini-fridge and en suite bathroom with shower. The deluxe cabin door opens to spectacular sea views. She takes a maximum of 10 guests on scheduled trips but can accommodate up to 12 guests on charter basis. Giamani operates both in Thailand and Myanmar. Phi Phi Islands, Hin Daeng and the Southern Islands cruises are two-days and two-nights. Similan Islands, Koh Bon, Koh Tachai and Richelieu Rock trips are four-days and four-nights. These may be combined for six-day diving safaris. Mergui Archipelago, Myanmar itineraries are by charter only. She is available for individual bookings as well as charter cruises. Individual prices are listed below in the schedules. Please contact us for charter prices. All departures are from Phuket, Thailand, serviced by Phuket International Airport. The vessel departs from Chalong Bay, Phuket and from Thap Lamu, the port just north of Phuket. Transfers are arranged to and from your hotel or the airport to the boat on departure day for 300 baht per passenger each way. Transfers from the meeting point to the boat are free of charge. Dive Computer Rental 300 THB per day. Please note that the use of diving computers is mandatory. Torch rental is 100 baht per dive. Thailand six-day national park fees are 2200 THB payable on board. Nitrox tanks are 300 baht per fill. Join in transfers from Phuket hotels or airport can be booked for 300 THB per person each way.